Students paste red ribbons on a window in memory of those lost to AIDS. LONDON — The number of people living with HIV worldwide has remained virtually unchanged in the past two years and AIDS-related deaths are at their lowest since peaking almost a decade ago, according to a report from the United Nations AIDS agency released Wednesday. Officials declared that ending the AIDS epidemic is possible even though they acknowledged the number of new infections – more than 2 million last year – was still very high. UNAIDS estimated there were about 35 million people living with HIV last year and in 2012. The agency also set targets to reduce deaths and new cases by 90 percent by 2030. It previously unveiled a strategy to get to “zero AIDS-related deaths,” which included ensuring all people who need treatment are on it by 2015. Last year, there were about 12.9 million people receiving life-saving drugs and 22 million people still waiting. 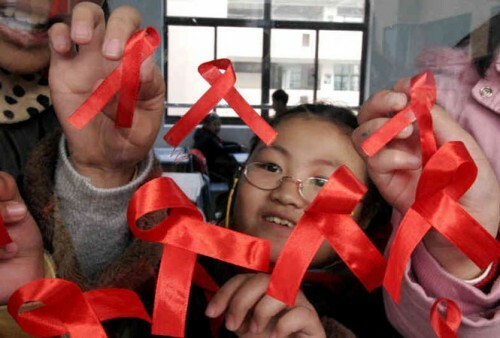 Some 1.5 million people died from AIDS-related causes. Other health experts questioned whether setting more ambitious targets is wise. Still, UNAIDS insisted in its report that we are at the “beginning of the end of the AIDS epidemic” and said the global outbreak can be stopped by 2030. But with no vaccine and millions of people carrying the virus or becoming newly infected, some scientists said ending HIV may be idealistic rather than practical. Jaffar said it was misleading to suggest we are close to eliminating AIDS. “The road will get longer and harder and we really don’t know where we’re going to end up,” he said.